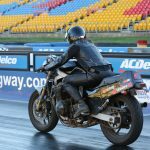 The decision was made I needed to work on my race starts, so what better way than to head out to Sydney Dragway to one of their bike nights they hold once per month during daylight savings. 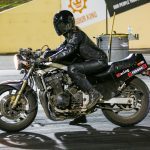 The idea is that you rock up on your road bike or close to (track bike in my case) and launch it down the quarter mile as fast as you can all for the measly sum of $60 for as many as 10 runs we ended up getting on the night. That is seriously great value for a race track of international standard! 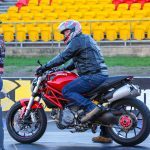 I put out the invite on DOCNSW Facebook page for anyone that wanted to join me in this madness and ended up having a good response of 10 Ducati’s turn up as well as some friends of the club on other manufacturers bringing our group up to about 14. 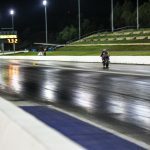 Given the numbers Sydney Dragway assigned us our own staging lane so we could all race together and against one another. This made for some good match ups and a really fun night. We were also lucky enough to have Siita and Hus (Shonky Snapz) come out and cover the event with their serious clicking skills and captured some great shots of us all. 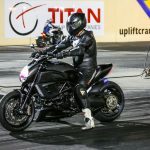 I was plagued by clutch issues but still managed to get down the quarter in a respectable 11.1 seconds, some other the other guys however got down to as low as the mid 10 second range which is very impressive for ‘road’ bikes. Towards the end of the night though I had a bit more feel on the clutch so I think it has worn in a bit and hopefully no more repeats of stalled bike on the line. 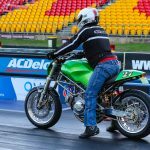 The next Sydney Dragway Bike Night will be held on Thursday October 11 so hopefully we will see you all then for another fun night of light hearted and social racing. 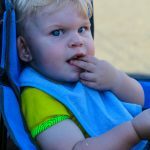 Entry Fee – $60 to race, $20 to spectate. 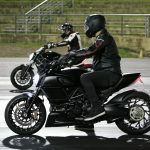 Both registered and unregistered bikes welcome, as long as above is met. Registration is open from 4:30 until 8pm. Racing is from 6pm until 9:30pm. 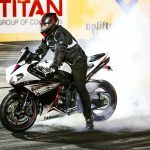 No requirement for burnouts, perfect for any skill level. Our next dragway night is when daylight savings kicks back.We’ll be there on October 11th. Details in our events calendar. Hope you’ll come out and join us. 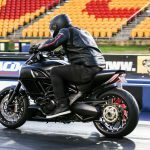 This entry was posted in Dragway nights, Ducati Owners Club NSW Racers. Bookmark the permalink.